so others may today . . .
be forgiven of their sin. Your life in theirs embrace. see Your glorious Son rise! I am the Life . . .
you believe I will forgive. in Me, for this to be true! in me shall never die. for the crowd to get their way. put the hammer to that nail. the spike of their distaste. and so they nailed the Lord. so all sinners could go free. one nail was all it took . . .
for Jesus to be sacrificed! who can set a sinner free. a refuge and a shelter. for I am God’s, risen Son! 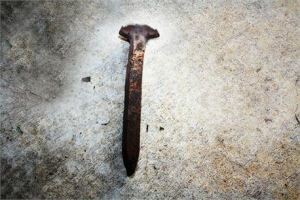 as they began to nail the Lord. just one strike upon that nail . . .
and our Savior they crucified!